It was great to see everyone for our training Symposium at the Silver Legacy Hotel in Reno back in April. We had a really good turnout, and it seemed like everyone enjoyed themselves, as well as the presentations that were made to round out our training program. PORAC covered a gamut of information pertinent to you, its association leaders and members alike, discussing the strategies behind our legislative goals, as well as looking at a couple of timely case studies, which I think will prove to be instructive to our profession in the years to come. For those of you who provided us with feedback on the instructors and content, I appreciate the time that you took to tell us what you liked or thought could be improved for future PORAC Symposiums. Also, thanks to PORAC Treasurer Marcelo Blanco’s efforts at Symposium, we were able to collect nearly 200 more signatures on the petitions to reform the death penalty! Suffice it to say, as you read this message, our efforts were successful and we learned that this initiative qualified for the November election last month. If you circulated a petition, facilitated a meeting to get signatures, or somehow helped or additionally donated to this effort, you certainly deserve a shout-out as well. In the face of the cost of nearly $10 per signature, professionals from throughout the criminal justice system raised approximately $2 million and collected over 18,000 signatures. I think that this is remarkable, as we really didn’t get this mobilized until mid-February. But the toughest road for this initiative is still ahead. We must now run a campaign. While this will take money, I think that the real thing that our membership can do is get the word out about this initiative, and make sure that you, your family, friends and respective law enforcement supporters know that we need (and want!) their vote to ensure that swift, fair and efficient justice will come to those who have been condemned for the most heinous crimes against our communities. While it may seem simple, our death penalty reform initiative will be competing with an initiative to completely eliminate the death penalty. And in a year anticipated to bring record turnout by the electorate, it will be imperative to rally those who support our reforms to ensure that we have an option available to deal with the true monsters who live among us. As we get closer to November, please keep an eye out for additional information on this, as our coalition will definitely need your help! As our Symposium attendees noticed, I invited representatives of our three trusts, as well as our trustees present, to staff a booth in the hospitality area. I really wanted to give our members the opportunity to ask questions or get additional information about the benefit programs that we provide, as well as how to get connected to them if your association isn’t already. All three of the trusts are engaged with the members on issues now, more than in the past. The Legal Defense Fund and Insurance & Benefits Trust have just completed rate-setting for the coming year on their respective plans, and the Retiree Medical Trust is seeing a spike in interest in participating, given the seemingly slow (but increasing) rebound of contract bargaining all over the state. Often, it is that one question that gets answered about an insurance plan or coverage benefits that sparks an association leader to pursue a new benefit for their members. To that end, if you have a question, all contact information for your LDF, IBT and RMT trustees can be found on their specific website landing pages, links to which appear at the top of www.porac.org. Speaking of trustees, as I mentioned in April, one of the two trustee positions within Region II for the Insurance & Benefits Trust became vacant. Upon notification of this, a special election was triggered and subsequently closed with only a single nomination. As such, per the bylaws, I declared the candidate elected by acclamation. Former PORAC Board member and current Sacramento POA Treasurer Mike Boyd was sworn in on April 19 and will fill out the remaining seven months of the term. Now that Symposium is behind us for 2016, PORAC is eagerly preparing for our Annual Conference of Members in November. In case you hadn’t heard, this year’s event will be held at the Disneyland Hotel on November 18–20. Costs for registration and the associated events are now available at www.porac.org/events/conference/registration. While registration won’t open until early July, you can go to that page now, enter your email address and receive a notification when it does. As a reminder, you must register for Conference first to get access to the PORAC room block. It can’t be overstated this year that you need to register early to ensure that you and your association representatives have a spot to join us. Also, after hearing your concerns last year, you will be able to register up to five people under a single point of contact for your association or organization. 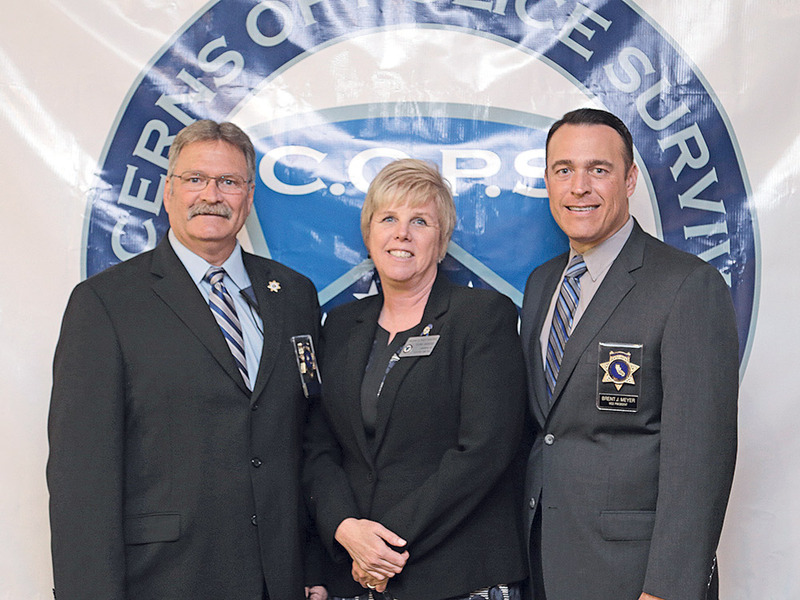 Photo Info: President Durant and Vice President Meyer with C.O.P.S.